Divide By One: R-O-C-K in the U-S-A! NOTE: the previous post has been updated with pictures, video, and a few more stories. 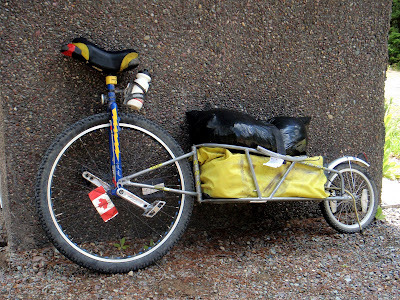 "Many wild, remote stretches exist along the trail that are not elaborated on here. High temperatures, lofty elevations, wild animals, inclement weather (including lightning storms and extremely strong winds), and other potential hazards are plentiful." **dangerous, or simply more exciting - your call. "A high-quality water filter is mandatory; advisably, carry one filter per person in your party." **how about no water filter for either person in the party, and simply hoping that a tiny eyedropper of clorox bleach will suffice? "A minimum group size of three is strongly recommended." **i'm lucky to have even one other person along! "Your bike should have at the very least a front shock absorber. A fully suspended bike is even better." **i have two shock absorbers: my left knee, and my right knee. "DO NOT attempt to ride this route without an accurately calibrated odometer on every bike in your party." 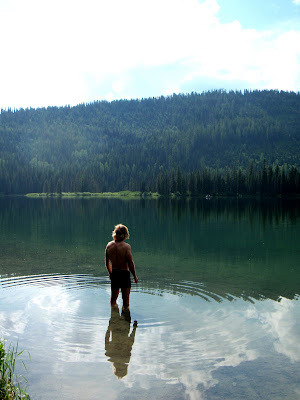 **my odometer stopped working on day #3.
well, despite fair warnings from Adventure Cycling Association, here we are in Whitefish, Montana, enjoying the incredible hospitality of the kohnstamm family (meals in a treehouse?! yes!). 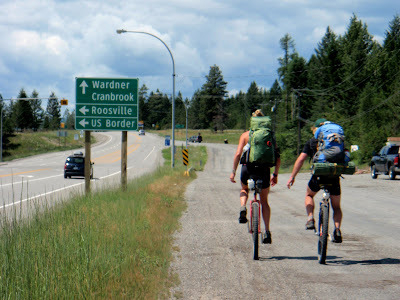 a lot has happened since Elkford, BC, where i last posted, not the least of such happenings was crossing into the United States. we experienced the incredible beauty of the canadian rockies and loved watching the mountain terrain change as we headed south. regardless, it was very nice to get back in the states, to a certain amount of familiarity, and lower prices all around. our last days in Canada were full of daisies, dandelions, and grasshoppers. each of the three swarmed our existence in a way to rival an egyptian plague. only the latter were not welcome. camping along the elk river one night, we opted against a grassy campsite simply to avoid the kingdom of grasshoppers; instead, we slept among mosquitoes, ants, gnats, moose poop, and cow pies. yes, the grasshoppers were that bad. other than animal entertainment, we have found our own as the road unfolds, especially as we get bored on particular stretches of pavement along the route. we all know from our years of growing up, a "dare" can go a long way... combine with rumble strips, and stir. riding out of Fernie, British Columbia, we scoured the landscape for a place to stealth-camp between residences. following an unused road up a hillside, we found two uninhabited cabins, complete with an outhouse and luxurious porches that sheltered us from the rain as we slept. however, structures that protect against rain do not necessarily protect against wildlife - emphasis on wild. in the middle of the night, matt and i awoke to the sound of an animal snorting and stomping its hooves. the stomping vibrated the ground and porch underneath us, and a buck, who was calling for a fight, paced anxiously 15 yards away as we peered out from our sleeping bags. it was our attempt to find "night mode" on the camera that finally scared it away. thankfully, we had no problem at all with the border patrol agents, whose poker faces showed nothing more than a faint curiousity in the uniquity of our journey. i probably could have gotten my camera confiscated for the following video, but things went smoothly. yes, this moisture formed large droplets and decided to nearly flood the hotel parking lot where we had stayed. the video does not do it justice; needless to say, we were dreading riding through the storm. 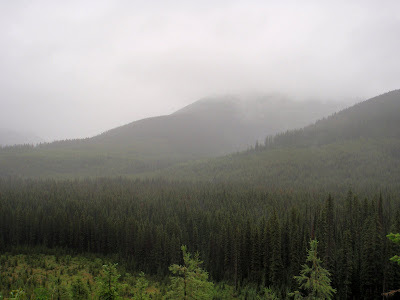 this rainy day involved a very long, albeit beautiful, climb on our way up to whitefish divide. our new friend kurt, who is hoping to continue his journey around the world, rode with us for a couple of days, and showed us how to find a haven in the rain, though it was 5.5 miles off-route, each way. 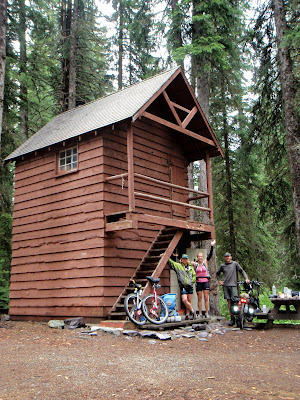 weasel cabin is a primitive abode in the Kootenai National Forest, and an oasis for numb, drenched cyclists desperate for heat and a dry bed. it was definitely worth the side-track, even though the miles were nearly all uphill. it's hard to beat a wood stove-heated cabin, hot cocoa, and a pancake breakfast. 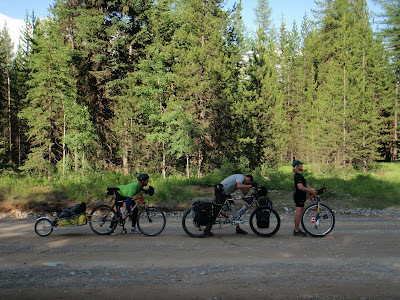 with fatigued quads, we mounted our trusty steeds the next morning, rode up over whitefish divide (deceitfully, not a continental divide crossing), and down toward Polebridge, Montana, near the border of Glacier National Park. 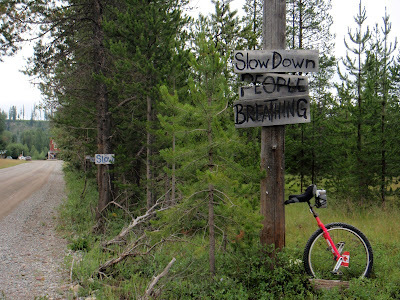 on the way, we met up with great divide cyclist allan mcgarvey, who rode with us for two days, which was apparently enough for him to understand why he would never - ever - want to ride a long distance on a unicycle. with two bicycle contraptions and two unicycles, we appeared to be quite the circus. 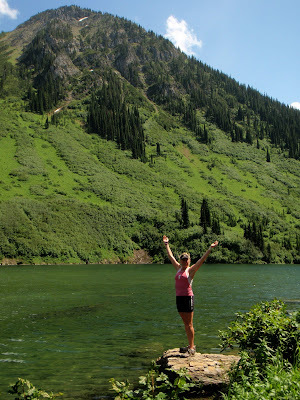 from Polebridge, we climbed over Red Meadow Pass, listened in on the efforts of national forest employees as they tracked a nearby mama grizzly and her 3(!) cubs via radio, antenna and tracking collar, and savored the beauty surrounding multiple roadside lakes. the campsite at which we plopped to finish our day sat adjacent to upper whitefish lake, and boasted an incredible view. what we didn't see at first was discovered later during an attempt to gather firewood to cook dinner. had we arrived earlier, we might have found dinner in this discovery: a whole, raw chicken sitting on the ground beneath a tree. what?!? who does this sort of thing? perhaps this display of stupidity is the sole reason that the U.S. has so few user-maintained recreation sites, unlike its northern neighbor; in the heart of bear country, someone left a raw chicken sitting outside the package. matt and i have not seen any bears yet, and i kinda hope to keep it that way, so we moved to another campsite, as if that would actually help. the one cool thing about a decomposing, featherless bird was the wide and stunning array of beetles it drew to its carcass. even though i cried "EW!!" repeatedly, i couldn't help but linger to stare at the impressively colorful insects. 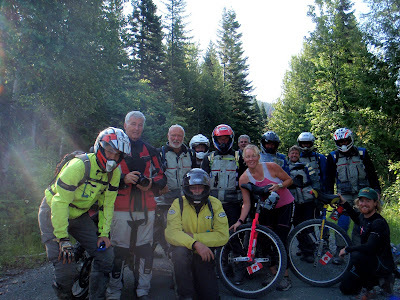 on my unicycle trip coast-to-coast in 2006, the motorcyclists were by far my favorites with whom to cross paths. nothing has changed: they are always enthusiastic, generous, and encouraging, comprising a genuine bunch. 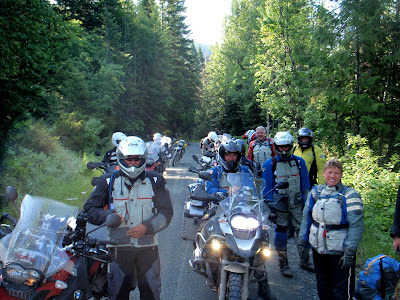 while we rolled toward Whitefish, we ran into this group of 15 bmw motorcycle tourists, also riding the great divide route. we exchanged lots of laughs, and they even gave us some candy (i.e. sustenance!). one aspect of the trip that hasn't been laugh-inducing has been struggles with seat discomfort and knee pain; matt has been one tough cookie and battling both of these nearly the entire trip so far. special thanks to Glacier Cyclery in Whitefish for letting him ship a new brake to their shop, where we picked it up yesterday. we hope the brake will relieve his knees of the pressure and impact on descents. but what to do about the seat? there have been many-a-seat modification thus far, and probably more to come. we continue to hope for best with each change, and are trying to keep it relatively simple. 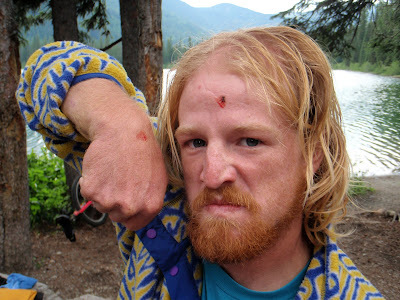 in addition to seat issues, there are always questions of how to deal with other problems while in the backcountry. for instance, what do you do when you lose your unicycle, or if someone steals it? 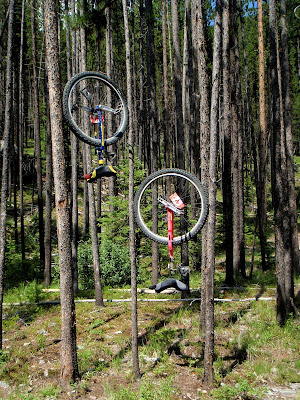 find a unicycle forest and pick one off the trees - they're organic! and what if the backpack becomes too uncomfortable to carry our stuff? it's a rest day during which we continue to savor the kohnstamms' amazing hospitality and treehouse meals. perhaps it would do me well to get away from the computer and explore town a bit (i.e. sample the local ice cream). Baby, just now read both of your posts. Well done. You and Matt are on a grand adventure, indeed. I'm quite impressed with your ability to video while riding. The live action shots add much; however, I'd limit video shots of grizzlies. Hope Matt's been able to rig a seat that minimizes the discomfort. Hey Matt, bet you've thought a day or two about using a two wheeler? Good work, both of you. I look forward to reading your future posts. The Lord keep you both, from bears, snares, and lairs. you guys are still completely insane! 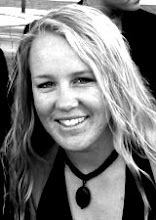 Good to get your blog post! What amazingly beautiful country you've passed through. Thanks for sharing it. We're all rooting for you!